Magnificent scenery, wildlife and waterfowl, historic sites, and outdoor adventure await you in La Grande. Nestled between the Wallowa Mountains and the Blue Mountains, La Grande is located off of I-84 in the Grande Ronde Valley. 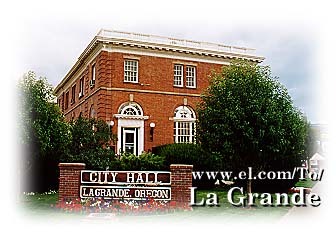 As Union County's county seat, La Grande is a bustling and vibrant small town community. Uncrowded camping, hiking, backpacking and nordic and alpine skiing are all available for visitors. La Grande is close to the Wallowa-Whitman National Forest. This national forest is over 2 million acres in size and includes all or parts of the Eagle Cap Wilderness, Hells Canyon, Monument Rock and North Fork John Day wilderness areas. There are 60 campgrounds, and more than 1,700 miles of trails. There are also opportunities for snowmobiling, mountain biking, camping, picnicking, swimming, boating and water skiing in the mountains, trails and lakes in the national forest. Fishermen can try catching some of the 13 species of fish, including trout, steelhead and salmon, in the many rivers and lakes. Or, try some hair-raising white water rafting on the Grande Ronde River. Downtown La Grande has a pedestrian friendly shopping district. The tree lined streets enhance examples of turn of the century architecture, all adding to your rural shopping experience. Eastern Oregon University is just a ten minute walk from the shopping district. The university serves ten counties east of the Cascade Mountains in Oregon. For small town warmth with big city conveniences and the exciting recreational activities that only Oregon can provide, come and experience historic La Grande. Experience Oregon's history by visiting the Oregon Trail Interpretive Park at Blue Mountain Crossing. You can stand among the towering pines and view traces of the trail where it crossed the Blue Mountains. Or, walk beside the wagon ruts and see where the iron-clad wheels scarred the trees as Oregon's pioneers continued their long journey westward. Just past the crossing, a side tour takes you to the Whitman Route Overlook. This rugged canyon route taken by Marcus and Narcissa Whitman in 1836 was later considered too difficult for wagon travel. The Overlook offers a panoramic view of Meacham Creek Canyon. Dramatic recreations of life on the trail and extensive exhibits can be seen at the National Historic Oregon Trail Interpretive Center, which is less than an hour away from La Grande near Baker City. Information - Union Co. Economic Development Corp.